Here are the first ones for tonight! I can post specifications later on. Left, or Engineer's side - front view. "Pumpkin" paint scheme. Posted 10/24/2001 @ 22:05:00 by Scott "SET"
Wow, thanks Scott, I've never seen the inside of one before. Just came from my other BB forum, autobody.com, and I bet those guys would like to know how this big dude was painted. You can tell what Scott's other passion is, photography or trains? Thanks for the great pictures. Glad everyone liked these shots! The interior shot[s] are from the newer models, which are extremely nice inside - as compared to legacy models. I'll post some shots of legacy interiors / control panels to show the major difference between "Circa 1970/1980's" models and "Circa 1990/2000's" models. The Joystick controller takes the place of Two separate controller handles on the legacy models. Instead of one for "Power Throttle" and one for "Dynamic Brakes", the Joystick incorporates them both into one control device - Power Throttle positions from the "Center Position" incrementing in the forward direction of movement [slide forward], Dynamic Brake from the "Center Position" incrementing in the backward direction of movement [slide backward]. Since there is a need to Idle Down the Prime Mover [Diesel Engine] prior to the use of Dynamic Brakes, the "Center Position" is an almost natural and comfortable position for this to rest at. Time delay is supposed to be no less than 10 seconds between moving the Power Throttle from position 1 thru 8 into "Idle", then moving to any position [1 thru 8] for Dynamic Brake. Most of the time, Engineers will begin Dynamic Braking far before the 10 second minimum - more like when the Prime Mover is near Idle, because they want to keep the Train's speed within the "Effective Braking Region". This is normally between 12 and 25 MPH for normal Dynamic Brakes, and from 6 to 35 MPH for Extended Range Dynamic Brakes. Need to include some specs' for these units. The numbers are impressive! Does the dynamic brake generate power to be stored in a battery and/or capacitor bank? Or is it just wasted as heat? 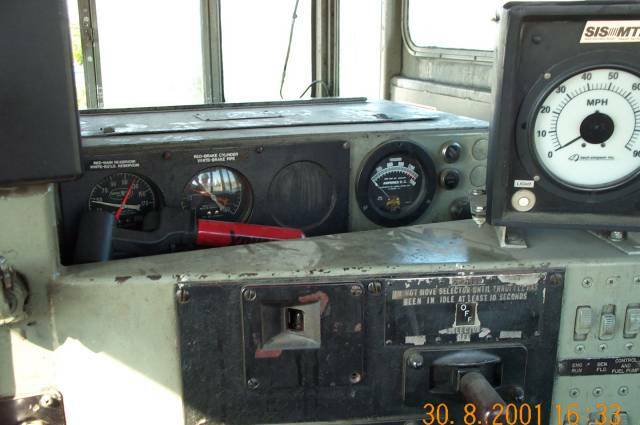 The inside of the cab pic is great! Did the engineer let you in, or was this a clandestine shot? 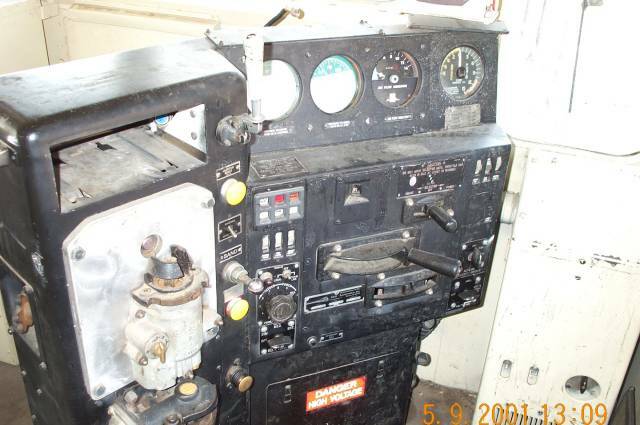 Here's a couple shots of "legacy" unit Control Panels [Locomotive Controls] which were taken recently. Once I locate some good ones from my "Archive Of Photos", I'll scan them and post. 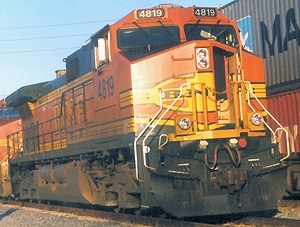 The Dynamic brakes on Diesel-Electric Locomotives with DC traction Motors will send regenerated current through a Resistor Bank and dissipate the regenerated Power [in this case, True Power, in Watts] as Heat. 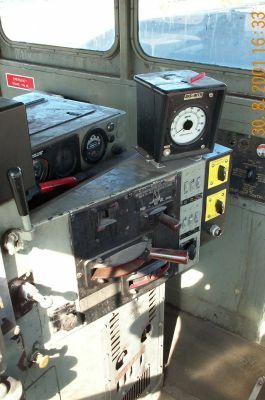 The Dynamic Brake Resistor's "Blister Pack" can be easilly identified on EMD Locomotives, since they are really apparent! 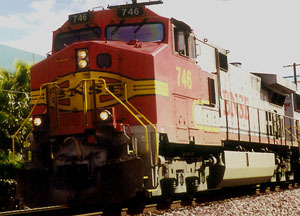 For Locomotives with AC Traction Motors, the Dynamic Brake system is truely a "Dynamic Brake". These have DC "Injected" into the Traction Motors [refer to my Dynamic Brake Motor Control Schematic]. The DC method is in reality "Regenerative Braking" since the Motors generate DC power back, which is then applied to the Resistor array. This method could be thought of like a "Jake Brake" on a diesel truck. On Electrified Railways using DC power throughout the system, the Dynamic Braking of Trains can be taken advantage of and "recovered". These usually will apply some of the Dynamic Braking power back into the system via Diode arrays [for proper current flow direction / polarity]. For AC powered systems, this can be an Engineering Nightmare!!! The shots from, or in Cabs were with the Train Crew's permission. I have many older shots taken from the Cab[s] of Amtrak Trains while we were in service [taken while riding in the front unit's cab]. Most were between San Diego and Fullerton, plus Fullerton and Los Angeles. The one with me in Barstow was during a Station Stop at Barstow, which is why I am shown at the traditional "Engineer's Side". 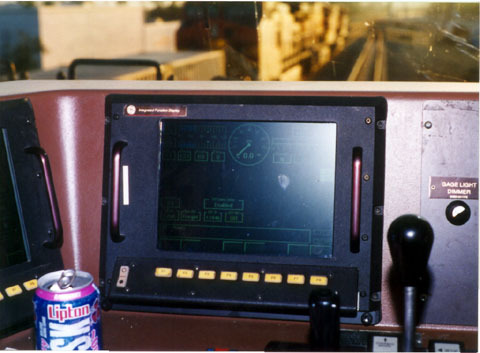 The interior cab shot of the C44-9W # 4819 was taken in Yorba Linda [where the Weir Canyon Rd. offramp is off the 91 fwy.]. This Train, plus the one next to it on the right [from the cab shot, it's on the left], were stopped to allow Metrolink Traffic clearance. During the peak Metrolink operating hours [5 to 8 AM and 3 to 6 PM], they will be kept here until Passenger Train Traffic has lightened up. Mostly the District [Tracks] that run off this District to San Diego call for Freight Traffic to hold up here. That District is the one which goes over the 91 fwy between Fry's Electronics and Tustin Ave.
That District has only one Main Line, while at the point where #4819 is stopped, there are three main lines. These two Trains are stopped at the Junction where the 3rd Main Line begins/ends off of the "North Track" of the two main line 3rd district. The 3rd District [running from LA to San Bernardino] is now mostly two main lines. Some places have 3 and even 4 main lines on the 3rd district. This particular 3 track section begins at Weir Canyon rd. and ends at Prado Dam [where the "Bi-centennial" Dam is]. The late night posting was from some odd hour work. Tonight it's because the clock is running too fast and no work for a while . Ya gotta love it. Aforum that combines my two favorite things, electricity and trains. Thanks Scott35, I need to tell a friend who is a firefighter to look here, he's also a railfan.